Sold new by Harrods of Knightsbridge, London, in 1928, this almost mint condition, heavy, gentleman’s solid silver cushion watch is the perfect example of the stylised models that represent the second generation of the vintage wristwatches, coming after the circular models that popularised the concept of the wrist worn timepiece during World War I. Vintage watches have enormous charisma, and are now the subject of a fanatical worldwide following which has pushed the prices of pieces by the famous makers to levels that are often beyond the reach of novice collectors. But with a little careful thought, some self-education regarding what constitutes a quality mechanical movement, and an unconventional approach that is not simply based around brand name hunting, some very high quality pieces can still be sourced at affordable price levels. 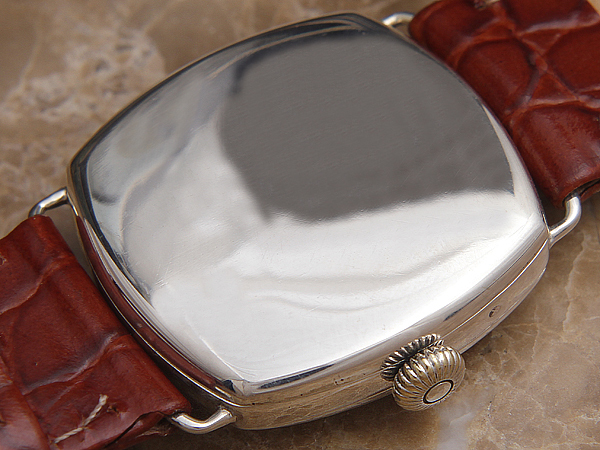 This watch is priced at a level at which it represents remarkably good value for money, especially considering its case is in solid silver rather than chromed nickel. Certainly, the future owner of this item can take considerable satisfaction that similar vintage watches for sale by known, high level manufacturers like Omega, IWC or Rolex would have a present worth of more than triple this amount. As an investment, models like this one could hardly be better. 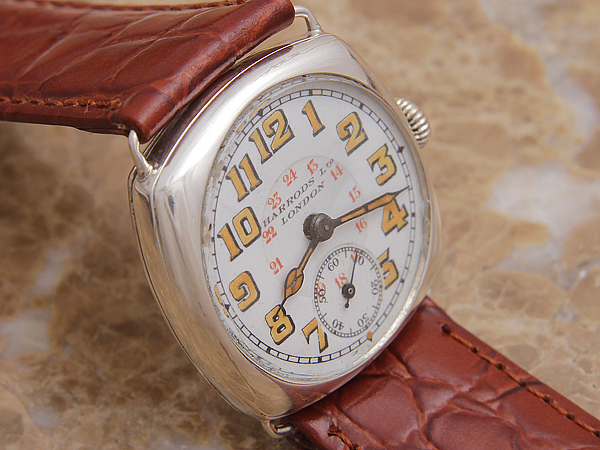 As more and more new converts to the cult of the vintage wristwatch become inspired to purchase and older pieces by the famous makers simply dry up, it seems almost guaranteed that items like this one will quickly ascend in value. 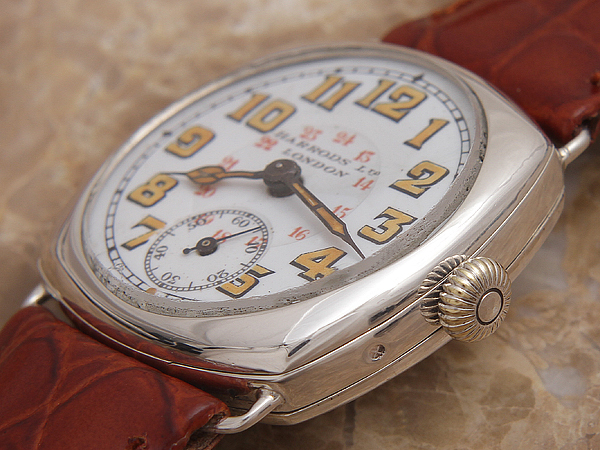 Six years ago, this watch could have been bought for £400. In another decade, as more new collectors begin to appreciate the remarkable quality of these very early items, we would suggest that this same piece will have a market value of between £1800 and £2000, which does make its purchase a tempting proposition for the buyer looking for a solid appreciating asset. The quality of this piece is superb, the incredibly thick sterling silver case being virtually unmarked. The inside of the snap on case back is entirely finished with a mirror polish and hallmarked as having been assayed in Edinburgh in 1928. 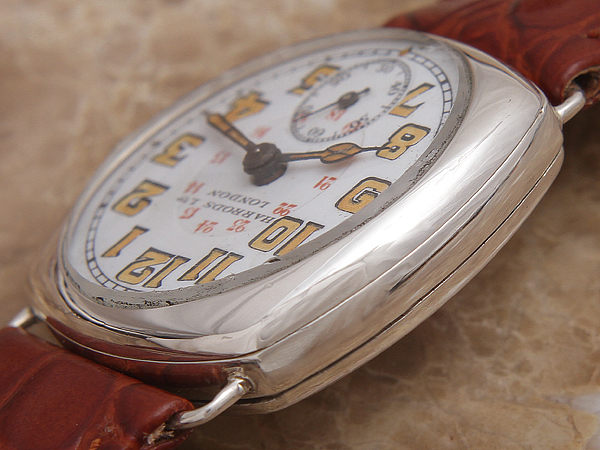 In itself, this polishing of an internal surface is always indicative of a fine grade of manufacturer, as only a maker working to a high quality standard would see fit to finish a part of the watch unseen by the purchaser to this degree. 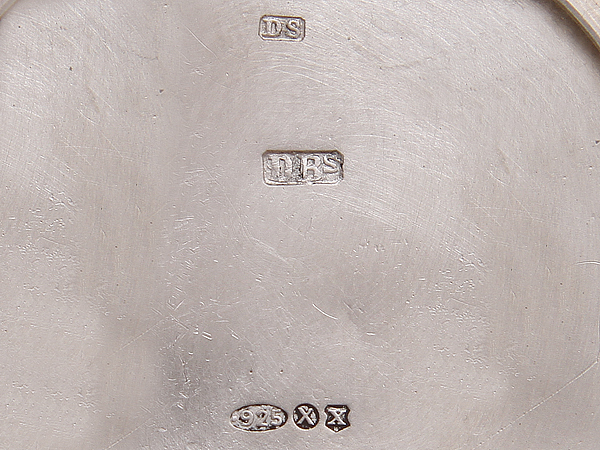 There are two sponsor’s marks stamped inside the case, both representing Dimier Brothers & Co. Based at 46 Cannon Street, London, this company was responsible for some superbly finished precious metal cases of the immediate post-World War I era and its stamps crop up not infrequently on private label models that were ordered by the various London high society retailers of this period. The original, French white, porcelain dial has very attractive stylised Arabic numerals and original matching tulip pattern hands. The dial is in near perfect condition, showing no deterioration whatsoever and no hairline marks at all; very unusual for an enamel dial of this age. The charming signature “Harrods Ltd, London” is crisp and perfectly defined. Based at Brompton Road, Knightsbridge, London, Harrods was, and still is, the capital’s most prestigious department store. As well as acting as official agents for all the important Swiss brands, it also commissioned its own range of watches, manufactured to an exceedingly high quality standard, of which this is obviously an example. 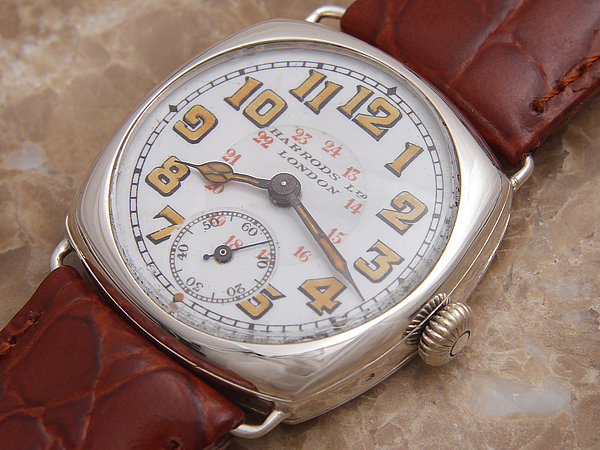 The hand wound, all mechanical,jewelled Swiss movement is of high quality and beyond any doubt, it was clearly an expensive, luxury model when new. Movements of this grade which are unsigned were usually produced by quality Swiss makers for sale to upper level retail jewellers who would apply their trade name to the dials and effectively take the credit for the production of these superb timepieces by implication. While we have not attempted to do so, it is usually possible to identify the source of movements from this period, with a good starting point for research being a polite letter accompanied by clear photographs to the Museum of Horology in La Chaux de Fonds, Switzerland, where a vast archive cataloguing early movement calibres exists. 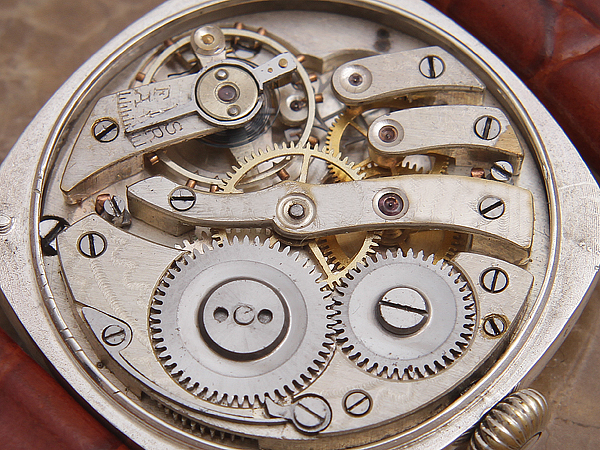 Importantly, the movement is in very good condition, with no changed components whatsoever. 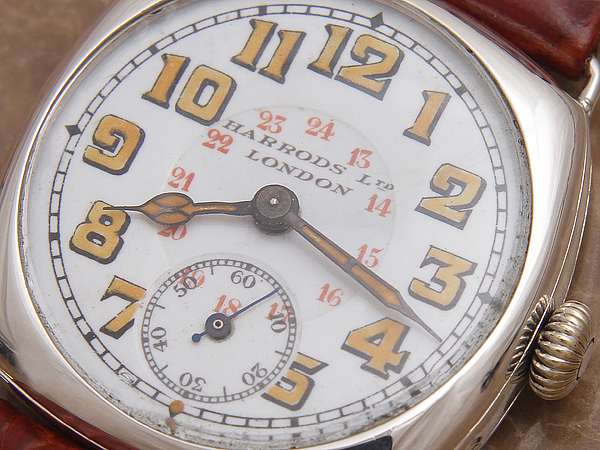 A lot of the surviving examples from the inter-war period have movements that have been adulterated with non-standard parts to keep them running, but this one is exactly today as it was when on display in London in Harrods’ Knightsbridge watch room in 1928. It hardly needs to be said that the watch has recently been serviced and works perfectly. The watch is on a high quality brown crocodile skin type strap, also in fine condition, having never been worn. So many collectors buy a fine vintage watch and then degrade the piece by fitting a cheap strap, but we entirely oppose this misguided policy. In our view, a strap must compliment the quality and aesthetics of a classic watch and the attractive item present on this piece performs this function well. This item is priced at £985 GB pounds at which level, in view of the quality of the piece and its exceedingly fine condition, it represents good value. Catering for a wealthy, fashionable customer base, Harrods of Knightsbridge played an important role as a pioneering retailer of fine wristwatches during the early days of the genre, and this item is a very attractive example of the firm’s private label output. During the course of a typical year, we do see perhaps three or four early watches with the Harrods London signature, but very rarely do we encounter one that is as immaculate as the item here.